Tributes have been paid to Miss Valerie Shepherd, who died peacefully on 27th October, aged 81. Miss Shepherd was Head of Berkhamsted Girls from 1980 until her retirement in 1996. Pupils and staff will remember her kind hearted character together with her strong leadership approach. Having joined from Wycombe Abbey, Miss Shepherd instigated significant progress to the school in her 16 years as headteacher. Under her tenure, the school site transformed in three major stages: The Nash Building in 1982, Centenary Hall in 1988 (now known at Centenary Theatre) and the Science Block (Cork Building) in 1993. On reflection, it is clear that Miss Shepherd was a forward-thinking head. Her legacy is apparent in many areas of the school in 2017. She established an innovative careers programme to inspire girls to succeed in the male dominated workplace of the time. Miss Shepherd was an advocate of education beyond the classroom. She supported lacrosse tours and music concerts to far-flung locations and she greatly believed in the impact of Outdoor Education. 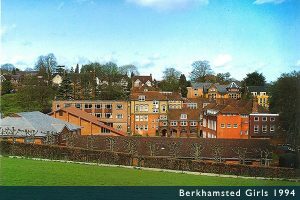 She established the first opportunities for girls to join Berkhamsted CCF pre-dating the whole school merger with Berkhamsted Boys. A recent success story from Miss Shepherd’s Headship is old girl Suzie Imber. From an early age Suzie was passionate about science and space exploration. Lately she won the BBC TV series ‘Astronauts: Do You Have What It Takes’ for the opportunity to join the European Space Agency. Many will remember Miss Shepherd’s great sense of fun. In 1988, long before schools commonly took trips to theme parks, Miss Shepherd organised a thrill-seeking visit to Alton Towers for every pupil and every member of staff. Discounting the conventional means of travel, she commissioned a special Berkhamsted Girls School train to take everyone towards the Staffordshire based attraction. Certainly a memorable way to celebrate the school centenary year! 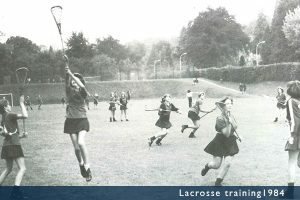 Pupils will look back fondly at some quirky examples of 1980s (and early 90s) school life at Berkhamsted Girls. Not least the excitement of seeing her dogs inhabit the school. Girls would enjoy the honourable task of walking Miss Shepherd’s loveable pets during break times. Valerie Shepherd was a headmistress of great poise and gravitas. She was a very intelligent woman who encouraged the pursuit of excellence inside the classroom and beyond. She was warm and kind to the girls and had a very dry sense of humour. It was the privilege of the LIII to take her two rather mischievous King Charles spaniels, William and Henry, for a walk at breaktime. William and Henry had rather different ideas about who was walking whom! She was always ‘Miss Shepherd’: to staff, pupils and parents alike. As part of the ‘Girls School’ as it was known, we were all part of the family, and Miss Shepherd knew us. She was genuinely interested in everyone and not only knew every girl by name, but could usually reel off a potted history of family members and where they lived and worked. As members of staff we would regularly spend an entire staff meeting going through the reports of every single girl, so that nothing was missed. She was the Mistress of ‘smooth running’ and the everyday business of learning and teaching was left in the capable hands of the staff. If things went awry she was on the scene in no time and problems were quickly sorted out. Although running a school was less regulated and formalised then than nowadays, she was managing a staff where a huge proportion were part-time, with all the timetabling and pastoral care issues that came with it. Many of us will remember her innate kindness above all else, always willing to listen to our worries, and help out if she could. Miss Shepherd had natural authority and presence but her softer side was not very far beneath the surface – she loved pretty clothes and teddy bears. She wanted no formal or fancy leaving ceremony when she retired but was delighted beyond measure by the surprise teddy bear’s picnic that the sixth form girls organised on her final day. It must have been one of the very few times when she was totally duped.